Line 2 cookie sheets with waxed paper; spray paper with cooking spray. In 4-quart heavy saucepan, heat caramels and water over low heat, stirring constantly, until melted and smooth. Remove from heat. Stir in pecans and cereal until coated. Roll mixture into 1-inch balls; place on cookie sheets. In 3-quart heavy saucepan, heat chocolate chips and shortening over low heat, stirring constantly, until melted and smooth. Remove from heat. 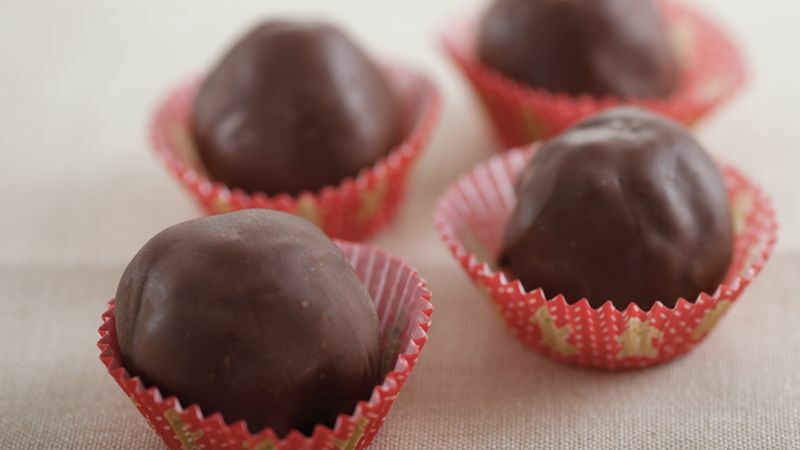 Dip caramel-cereal balls into melted chocolate, coating completely. Return to cookie sheets. Refrigerate 10 minutes or just until set. Store tightly covered at room temperature. Friends and family will rave about the toasty caramel crunch of these bite-size candies.